Provide comfort for the family of Ann DiBari with a meaningful gesture of sympathy. Ann Cecilia Moran DiBari, age 79, passed away on March 7, 2019 at her residence in Cherry Hill, NJ. Ann was born in Boston, MA and worked most of her career at Bank of Boston before moving to New Jersey where she was employed at Trump Plaza until her retirement. In her free time she enjoyed reading and cooking but most of all Ann enjoyed spending time baking for her loving son, Sam and her grandchildren. Her kitchen was known as the “Nana’s Cookie Factory” where she made dozens of cookies for her grandchildren, their friends and college roommates. 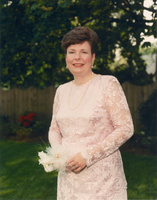 Predeceased by her husband, Joseph DiBari, Ann is survived by her son, Samuel A. DiBari (Patty) of Mount Laurel, NJ; her grandchildren, Danielle DiBari of Arlington, VA., Joseph DiBari of New York City and Kathleen DiBari of New York City; She is survived by her sister, Mary White of Duxbury, MA and her brother, Ronald Moran of Quincy, MA and her nieces and nephews. Visitation for family and friends will be held at Mt. Laurel Home for Funerals, 212 Ark Road, Mt. Laurel on Wednesday, March 13 from 6 pm until 8 pm. Internment service be held on Saturday, March 30, 2019 at 10:00am at the chapel at St. Michael’s Cemetery 500 Canterbury St. Boston, MA 02131. In lieu of flowers, donations to the memory of Ann Moran DiBari may be made to Lighthouse Hospice, 200 Lake Drive East, Suite 205, Cherry Hill, NJ 08002.